It is not surprising if a bird of this kind has such a striking scientific name, repeated then by many common names that copy the same characteristics. It is sufficient to observe it even if mixed with other birds with whom often shares various moments of the day, to understand the reasons. Brilliant colours with reflections of an unusual brightness strongly reflecting the sunlight when hit by the same, emphasizing unexpected shades. 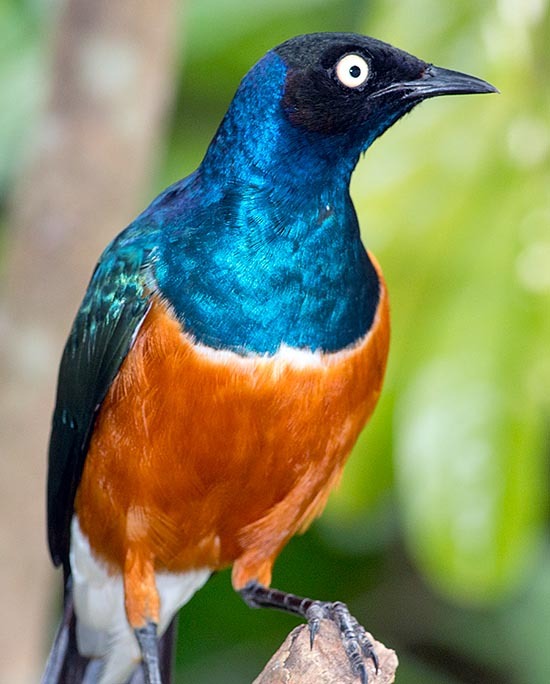 The Superb starling, also called Superb glossy starling (Lamprotornis superbus Rüppell 1845), belongs to the order of the Passeriformes and to the family of the Sturnidae and, as the name implies, is by sure one of the most beautiful specimens of this family. The human imagination often leads to think that the most beautiful products offered by the nature, whatever animals or flowers, plants or birds, are placed in hidden places, in inaccessible corners of the world, far away from where we live, but this is often totally contradicted. Typical is the example of this bird that, although considered as one of the most beautiful members of the avifauna, lives in close contact with the human being so much no to fear his proximity and to share his habitat and his feeding. Try to picnic in the shade of a nice acacia tree in Tanzania or in Kenya and after having well set the table, to lose for a moment the sight of the food. Thirty seconds and you will be surrounded by these birds that shamelessly and without any impunity will find the way of pecking at your sandwich taking off in one instance all what is withdrawable when then not to drink directly from your glass, whatever is the beverage contained. A real invader of the everyday human life even if outside from the inhabited centres it resumes its usual wild bird life, grazing in the savannah amongst the huge herds of herbivores. The ethymology of the genus Lamprotornis comes from the Greek “lamprotes-lampros” = bright, brilliant and “ornis” = bird whilst the specific name superbus comes from the Latin with the meaning of superb. Until a few years ago this bird was classified in the genus Spreo, a term derived from the nickname, in Afrikaans language, of Spreuw and that the French Levaillant had then transcribed by the end of the eighteenth century, in Spréo, rightly used in the previous classi- fication. Other vulgar names are: in French, Choucador superbe; in German, Dreifarben-Glanzstar; in Spanish, Estornino Soberbio, in Dutch, Driekleurige Glansspreeuw; in English Superb Starling and in Italian, Storno Superbo. 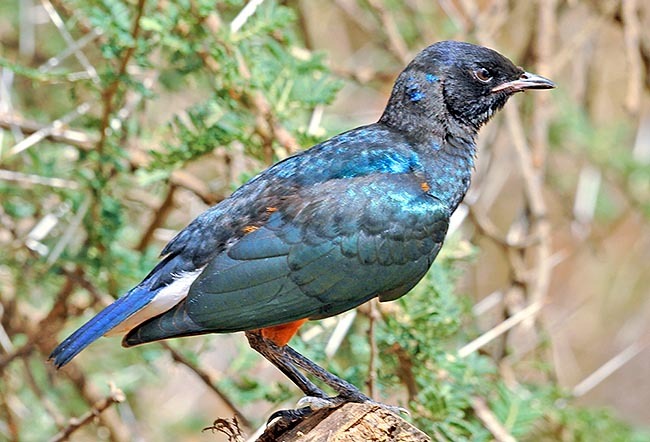 African bird only, the superb starling lives in the eastern part of the continent occupying widely and systematically Somalia, Ethiopia, Kenya, Uganda, Tanzania and the south-eastern part of Sudan Juba. It is sedentary and is not at all conditioned by the rain season or by the drought periods, adapting to the environmental situations of its territory under any weather condition. 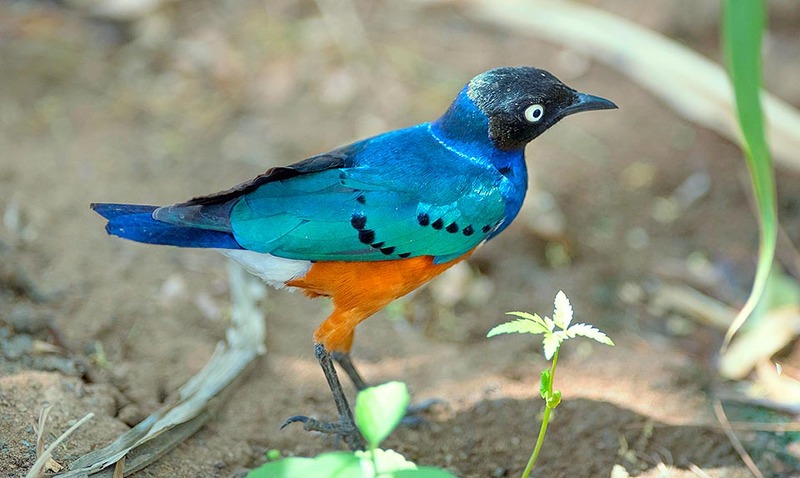 The superb starling is a typical inhabitant of the grassy savannahs with thickets of acacia, with thorny bushes and with soil covered by essences producing seeds. It also loves cultivated zones and in the cities and villages, gardens, parks and small orchards. Essential features of its habitat are the arid and dry zones and never with strong woody coverage or thick forests and, even less, humid and swampy areas. It does not like to go up in altitude and usually lives under the 2000 m.
As previously mentioned, it loves a lot to frequent the areas visited by tourists, activity from which has obtained a great benefit during the last decades. It regularly visits the lodges right in the middle of the parks, the refreshment facilities but also bars and public places where it is seen going around unfazed among the feet of the customers sitting at the tables. The superb starling is really superb in its colours. The head is wholly black spotted by very white eyes that stand out impressively. The throat, shoulders, wings and tail are of a bright metallic blue reflecting any nuance of colour as soon as hit by light rays. In this way it may eventually become cerulean blue to turn then suddenly auburn reddish, then dark black, then greenish blue and finally turn back to the usual bright blue. On the wings are lined up some blackish spots forming two well defined lines. Conversely, the chest and the abdomen are of a rust red quite contrasting with the upper cover and is separated from the throat by a well defined white necklace. The undertail is, on the contrary, white. Legs and beak are blackish blue. A real palette of colours. This bird, in its splendid livery, can be easily mistaken with other two species with whom it shares part of the territory as well as good part of the livery. The Hildebrandt’s starling (Lamprotornis hildebrandti) characterized by the reddish eyes, by the absence of the white necklace and by the slightly paler chest. 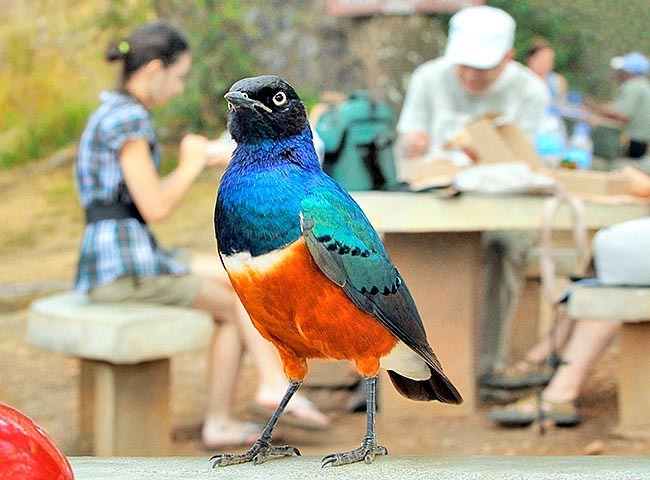 The Shelley’s starling (Lamprotornis shelleyi) very similar but also with orange eyes and without necklace as well as without black spots on the wings. There is no distinction between the sexes. The young of the superb as well as of the other mentioned species, have much paler and less defined colours, besides the dark eyes, characteristic they will lose when reaching the maturity, getting then the typical colour of the adults. 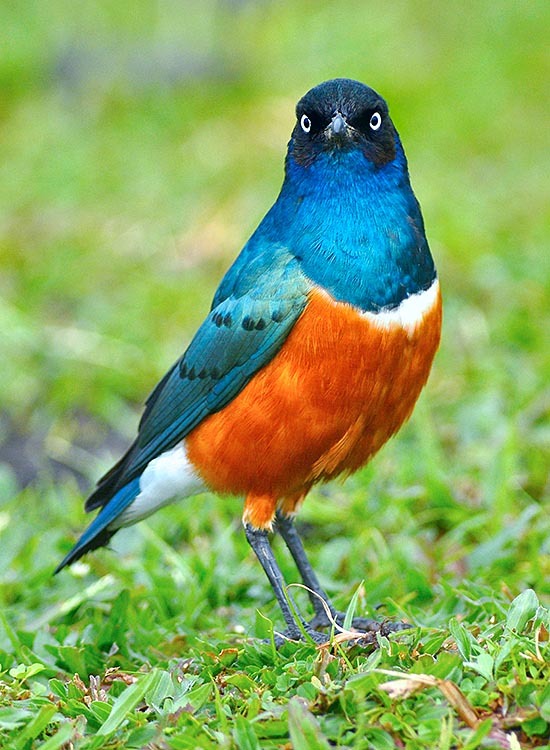 The Superb starling has the size of our Blackbird (Turdus merula) and a wingspan close to 30 cm, lenght of about 20 cm and weight of about 60-80 g.
The superb starling is insectivorous but does not fail to eat seeds and fruits and leftover food from the human activities. Usually it is monogamous but in its marked sociality often creates a family collaboration that sees the participation of various helpers in the partner’s work in growing up the progeny. It has been also found that some times the female mates with different males thus creating the conditions for this activity as well as for strengthening the genetic variation of the group. 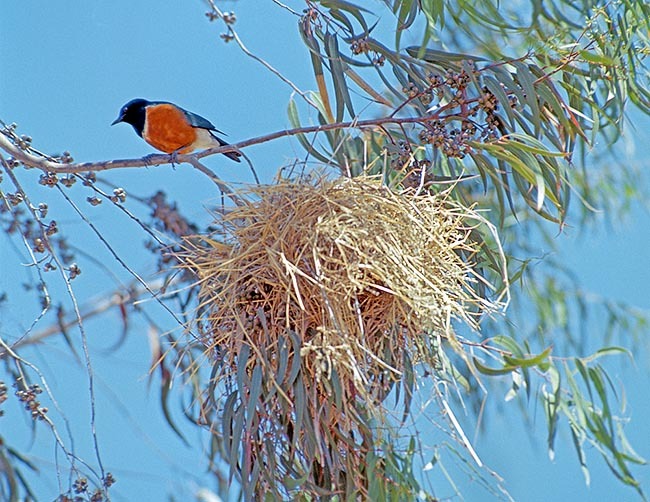 The nest is built amongst the most different places, often taking advantage of holes in old trees, on low thorny shrubs, on hanging branches of the high acacias and even on the rocky walls. It often steals others’ nests throwing out their content, eggs included and arbitrarily taking possession of them. When it is located in crevices, dry grasses and feathers are carried in whilst if it’s placed on trees, first is built an involucre of sprigs with a lateral entry often from below and covered inside by softer material. At the construction of the nest do often participate, besides the two owning partners, the collaborating helpers we have mentioned before. On the same tree usually are placed nests of other members of the group as well as those of other species of starlings with whom it peacefully cohabits. 3 to 5 eggs are laid of very strong pale blue colour, marked by reddish lines that are hatched for about 14 days by the female only. The chicks remain in the nest for three weeks more but keep linked to the parents for many other days after their first take off. When the food abounds, it may carry on more than one annual brood. These birds are very noisy and cackle continuously the whole day round, at times accentuating their cries when quarrelling with nearby groups or even with the neighbours of the same tree. Often these turmoils cause the falling to the ground of eggs and at times also of chicks still unable to fly. When the calm comes and in particular during the central hours of the day, the superb starling loves to melodiously hum softly, as to reassure the group and bring back tranquility. Besides being noisy when singing, it is also as such when flying due to the particular shape of the remiges that emit a substantial noise during the beating of the wings, a noise heard even from far away. Once the nesting period is ended, this bird gathers in very numerous groups, forming flocks at times of thousands of individuals that unite for spending the night in always habitual locations. It is a common bird and well widespread in its range and therefore is not considered as an endangered species.